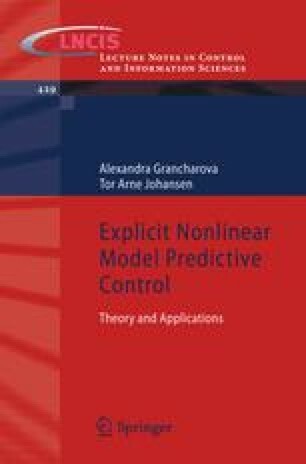 This chapter considers two approaches to explicit stochastic NMPC of general constrained nonlinear discrete-time systems in the presence of disturbances and/or parameter uncertainties with known probability distributions. In Section 7.2, an approach to explicit solution of closed-loop (feedback) stochastic NMPC problems for constrained nonlinear systems, described by stochastic parametric models, is considered. The approach constructs a piecewise nonlinear (PWNL) approximation to the optimal sequence of feedback control policies. It is applied to design an explicit feedback stochastic NMPC controller for the cart and spring system. In Section 7.3, an explicit approximate approach to open-loop stochastic NMPC based on Gaussian process models is presented. The Gaussian process models are non-parametric probabilistic black-box models, whose advantage in comparison to the stochastic parametric models is that they provide information about the prediction uncertainty. The approach in Section 7.3 constructs a piecewise linear (PWL) approximation to the optimal control sequence and it is applied to design an explicit stochastic NMPC reference tracking controller for a combustion plant.